Beds: 2 queens, 2 twins, Queen Sofabed in den. Contact: John and Caroline Moore. 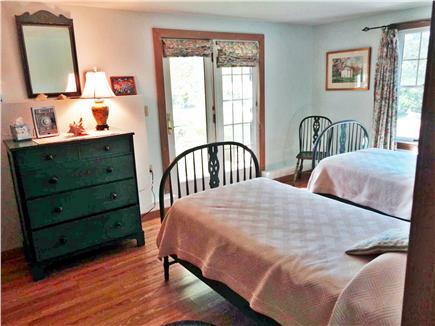 Fully equipped, open floor plan, contemporary three bedroom, two bath house on three acres surrounded on three sides by the Fulling Mill Conservation land. Immediate access to wonderful walking trails. 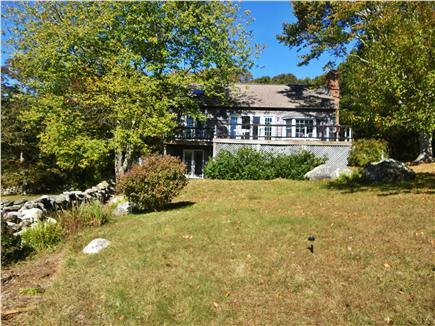 Situated among trees with view of meadow and 200 to 300 year old stone walls. Quiet, private neighborhood. Note: For 2016 we have changed rental periods Saturday to Saturday! Two queen size and two twin beds plus pull-out sofa. Linens), paper goods, soaps and kitchen supplies are provided. 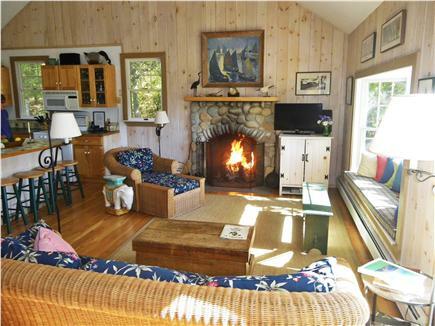 Wonderful getaway in the spring and fall as there is a real fireplace (firewood provided) and the house is heated. The house is less than three miles from the charming, picturesque fishing harbor of Menemsha and its restaurants and fish market (Larsen's...our favorite!). Additional pricing info: Utilities included as well as long distance U.S. phone calls except trash pick-up. State and local taxes of 9.7% will apply. My family had a wonderful stay at this house. It was comfortable, equipped with everything we could possibly need, and is located in a beautiful, peaceful setting. The owners were incredibly helpful and responsive before and during our visit. Our kids loved taking the canoe out on the pond to see the sheep and run around on Lucy Vincent. I highly recommend this lovely, homey house. There is a feeling to this place that pictures can't convey, and it's one of being far from the madding crowd. 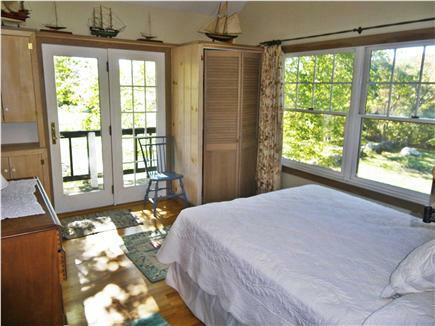 The deck looks out on a large meadow and many times, we could hear the ocean roaring in the distance. Nature feels dominant here with trails winding through the beautiful woods of the Fulling Mill Book Preserve. Beware the ticks, especially with dogs, but that is true everywhere in the NE now. You hardly every hear car traffic, something I really appreciate, as you enter down a small, winding dirt road to get to the driveway of the house. For beach access, you can drive a short distance and hop in a canoe provided by the owners that will launch you across a small tidal pond to the vast Atlantic and to Lucy Vincent Beach, which has restricted public access. This little trip feels more like a fun adventure than a hassle because what you see as you cross is beautiful in every direction. This property is beautiful and vast. There were often deer and rabbits in the yard which my three year old loved. Sadly the interior was fairly uncomfortable. Both of the beds on the main floor had such terrible mattresses that we had to buy a pad for one which we left (you're welcome!). The furniture in the living room is basically wicker and very uncomfortable. Admittedly, I am 7 months pregnant so comfort is high on my list of priorities. I also understand this is a rental and we have stayed in many on the island but even so this one feels like it may need a little interior updating (new mattresses, new kitchen items, etc...). The owners are very responsive and helpful. However, when we arrived one of the screens on the french doors leading out to the deck was ripped open and remained that way for the entire 2 weeks of our stay. This was unfortunate since the house gets a little warm (no AC) and having those doors open really allows for a breeze to come through. We're so sorry to hear of your disappointment, Terra. This is the first complaint we have had about the mattresses. Moreover, we stay there in the spring to open this and our other Vineyard (guest)house, ID 13169, and find them very comfortable for our old, octogenarian bones. We will check with other renters and if there is a hint of a problem, we'll replace them. We thank you for purchasing the pad and are more than happy to compensate you! Please let us know the cost. We agree about the wicker furniture and this spring had the cushions completely replaced on the couch. True, we could replace some of the kitchen items but we're thrifty New Englanders (living in Colorado) and hate to throw out perfectly usable equipment. That said, we will check on this when next at the Vineyard and will remove or replace those items that should be replaced. As for the torn screen, we immediately called a handyman friend to replace it as soon as we heard from the tenants. He said he would get right on it but did not. A call to another repairman resulted the same way. A third attempt was a charm. We now have a new, more reliable repairman on call. This was our second year staying at the house and we have nothing but good things to say. 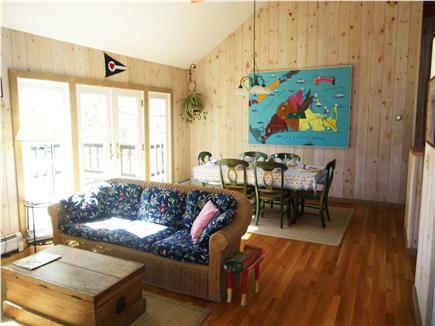 If you want a quiet, well-equipped up island rental close to Menemsha, Lucy Vincent Beach and Squibnocket, this is the place. 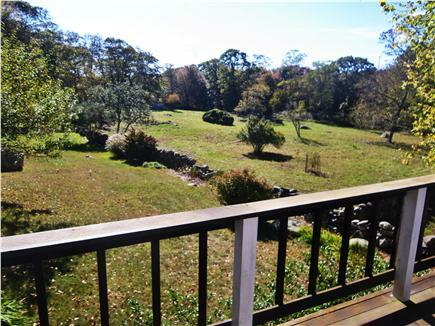 The back deck, overlooking fields and woodland, is wonderful for a read, a glass of wine, or both! We hope to return. 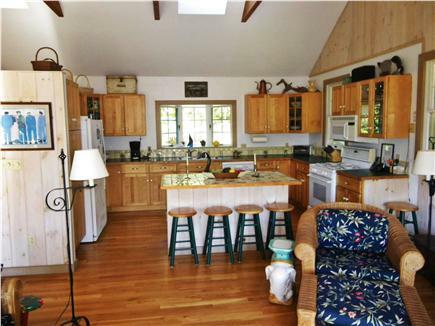 Your quintessential Martha's Vineyard home - bliss! About John and Caroline Moore. Originally from Connecticut, we have been coming to the Vineyard since we were children. We met here and spent our honeymoon not far from our cottage's location. We love this island and brought our children here any time John could get a 30 day leave during his 25 year career in the U.S. Air Force. In fact, in 1999 John wrote a history of the settlement of Harthaven, part of Oak Bluffs, reflecting six generations of our family's association with the Vineyard. We designed this cottage purposely to reflect the Vineyard's ''shack'' feeling, like the one nearby where we spent our honeymoon. And then we built it ourselves in 2000-01 with the expert help of one of our sons, excepting the electrical, plumbing and fireplace work. 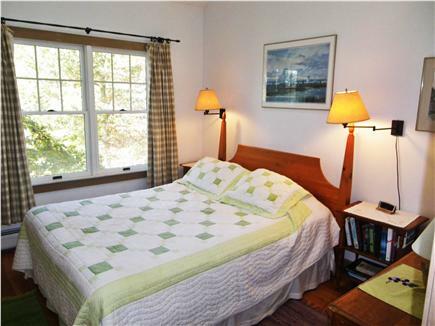 It is fully winterized and therefore nice and cozy in the early spring and late fall. There is a large lawn for kids play, croquet, etc. 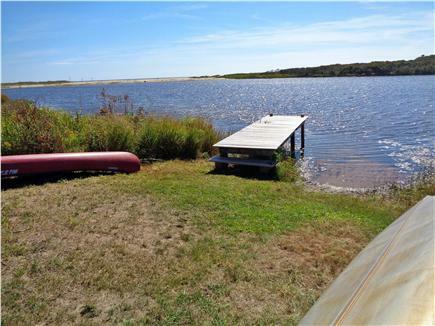 The included canoe and two kayaks are perfect for not only getting to Lucy Vincent Beach but also to explore Chilmark Pond. Immediately to the west of this cottage are the meadows of the Allen Sheep Farm. 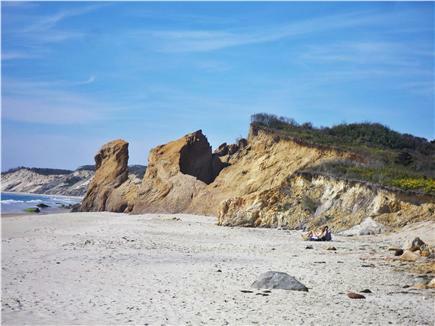 Chilmark is such a contrast to ''down island'' which becomes frenzied in July and August. Its old stone walls, views over lovely meadows and the ocean are so unique. There is a very active Community Center just over a mile away with all sorts of activities for children...and adults, including tennis courts.